The Ridgefield Family Resource Center is a community partnership that exists to meet the needs of students and families by providing food and clothing. The RFRC is located in a portable at Union Ridge Elementary School and is open to the community on Thursdays from 5pm-7pm. Ms. Poppert also works with students and families during the school day. Please drop in or contact Chris Poppert at 360-601-8920 or Allison Meade at 360-607-7363. We would be happy to work with you! The mission of Compassion 360 is to share the love of Christ by partnering with individuals and local organizations to serve the community. Compassion 360 is supported by the church as our primary way of meeting needs in our community, although it is a separate organization, allowing for participation by area businesses and other churches. Compassion 360 sponsors several events. 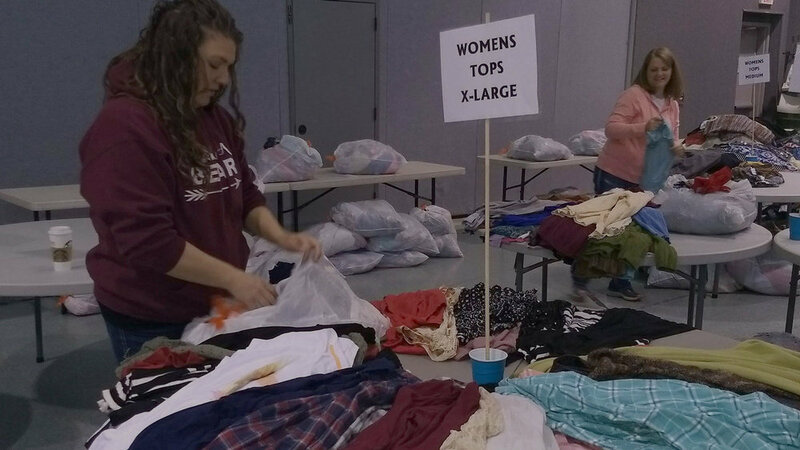 Closet Share is a quarterly event during which we provide gently used clothes at no charge to hundreds of families. Several families receive food, toiletries and clothing on the third Monday of every month through the Resource Share. In August we sponsor a Back-to-School Bash and provide free sports physicals and school supplies to help kids in our community be ready for school. Visit our website and be sure to visit our Facebook page to stay up to date. We are a Christian organization, associated with Ridgefield Church of the Nazarene, with a passion to serve our community. We aim to live out the scripture found in Micah 6:8, “…what does the LORD require of you? To act justly and to love mercy and to walk humbly with your God.” By serving together, we have gained deep, life-long friendships and look forward to building more friendships through service. We hope to show a little bit of Jesus’ heart by pursuing peace, justice, and love. As volunteers, we understand and have experienced seasons of life, which are marked by need, as well as seasons of life where there is plenty. We wish to extend a helpful hand to those who find themselves in a season of need, just as we were surrounded by loving support when we had a need. Our name, Compassion 360, stems from our 360 area code as well as the wide range (or full circle) of services we hope to one day be able to supply to our community. For more information, contact Sarah Stuart at 360-901-6439, Allison Meade at 360-607-7363. Compassion Ridgefield and most Compassion Connect clinics offer a free, one-day medical and dental clinic for the under-insured in our community. In addition, some have a Social Service Fair in which several community organizations provide guests with useful information and gifts. More understanding and less arguing. Confidence and clarity to talk about sensitive topics. Insight on how to be each other's cheerleader and lover. Whether you are in year 0, 5, 10, 25 or more, the Prepare/Enrich assessment will help you visualize your relationship, put facts behind your feelings, and discover ways to open up doors for communication and intimacy. Check out the Prepare/Enrich assessment to help you take the first steps. Strong marriages are vital to families, our community and our church. Call Pastor Jason at the church 360-887-3576 to strengthen yours. The Chronic Pain Support Group is a Christian-based support group for those who suffer from chronic, debilitating pain and/or illness. If you feel socially, physically, and emotionally isolated due to your on-going health issues, this support group may be helpful. Group meetings are structured to provide time to go through the Word of God and a time of prayer and encouragement. This fellowship provides compassion and understanding from others who also suffer. The focus is to give hope and encouragement in order to restore a sense of worth and purpose, to discover ways to cope and find strength, to accept and move forward, and to cherish each beautiful day. The group meets at 12:45pm on the 1st & 3rd Tuesday of each month in room 222. This group is open to the public. GriefShare is a friendly, caring group of people who will walk alongside you through one of life's most difficult experiences. You don't have to go through the grieving process alone. GriefShare seminars and support groups are led by people who understand what you are going through and want to help. You'll gain access to valuable GriefShare resources to help you recover from your loss and look forward to rebuilding your life. While we are not offering GriefShare classes at our church location, we recommend that you contact Barbara Waite, Vancouver Church leader, at 360-907-4950 for more information. "GriefShare helped me to see that grief was not something to be shoved deep down as a weakness but a journey to walk through with the help of God and with others going through it." "I don't like feeling vulnerable but as a group we were not pressured to speak. I felt it was okay to cry. As a group we could cry, then laugh and joke with each other within minutes of each emotional swing. That was wonderful." GriefShare has "...helped me get better not bitter." Life Packs are ready-to-eat meals you can keep in your car to give to someone in need. Every pack includes a non-perishable meal, drink, and a New Testament. The $4 covers the cost of the items. Pick them up before or after a service near the Information Center. Crisis Care Kits (CCKs) are a cooperative effort between Nazarene Compassionate Ministries Incorporated (NCMI) and Nazarene Missions International (NMI). CCKs continue to meet the needs around the world. The kits have gone to places like Belize, California, Dominican Republic, Greensburg, KS, Haiti, Jamaica, Jordan, Louisiana, Philippines, Senegal, Sri Lanka, Ukraine, and Zambia. Your generosity makes an incredible difference! Each local church is challenged to donate enough kits to fill at least one banana box (six CCKs per banana box). Small churches may combine efforts to fill banana boxes with CCKs. The CCK emphasis will be December (NMI's month of emphasis for Nazarene Compassionate Ministries); however, kits may be received year-round and people are encouraged to provide kits when disasters occur around the world so quantities will be sufficient. World Help is a faith-based humanitarian organization that exists to serve the physical and spiritual needs of people in impoverished communities around the world. Our strategy is based on the belief that true transformation is only possible when the needs of the body and soul are addressed simultaneously. This holistic approach of HELP and HOPE shows people that they matter to God both now and for eternity. We are committed to purposeful investment through sustainable programs, enabling individuals and communities to thrive—body, mind, and soul—and building lasting change for generations to come. Our church began a partnership with World Help in 2009 when the Children of the World Choir first came to visit our church. The children still perform at our church every spring. In the past, we have coordinated a Turkey Trot on Thanksgiving morning. The money made from the Turkey Trot was donated to Cause Life, a ministry under World Help’s umbrella that works to provide people in developing nations with access to clean drinking water. Several of our church families sponsor children from several countries through the ministry of World Help. For more information on this organization please click on the links below. Enable all partners to put a personal face on missions, to build relationships with fellow Christians in other countries, and to promote a sharing of resources that bears out the truth that we are all a family in Christ. Experience the Body of Christ in all its fullness, despite differences in culture, language, and geography. Help each partner find new ways to be involved in issues of social justice, compassionate ministry, evangelism, and church development outside their own countries. Bring new enthusiasm and inspiration to each partner in their own local ministries. Over time we have seen these goals come to fruition. Raxruha Nazarene has four mission churches that they have planted, one proposed site for another, and has one fully organized church that they have begun. When all churches and missions get together by the river to celebrate Raxruha Church’s anniversary, approximately 450 people attend. Public transportation in the area is limited and very few have their own vehicle.The Raxruha church has a vision to bring the church to the people. Although a church body can meet out in the open air (as one of the missions is now doing), or in a home, we learned that it is not very culturally accepted to hold church services outside of a building and for this reason building additions have been added by the hands of our members working alongside our friends in Raxruha. Joy! Check out our first trip in 2014 in detail here. In 2015 a second group returned to Guatemala.They led afternoon programs for the kids enrolled in the Child Development Center. They shared Bible stories, led a soccer clinic, and taught lessons about nutrition. They set up a small computer network for use by the church and the students. Another team poured a concrete floor for the church’s kitchen. Every evening they showed the JESUS Film in surrounding villages to help the local churches in their mission to reach their people for Jesus. In 2017 a third team returned to continue the work.This small but effective team repaired and rebuilt a cistern and plumbing supply system in order to provide clean water for the village.They also celebrated with the seven pastors who graduated from the Pastors Leadership program and presented them with a small library of Bible reference books in Spanish. In the fall of 2017 the leaders of the Raxruha church asked Ridgefield Church of the Nazarene to consider supporting the construction of a permanent building for ministry to children. Each church raised half of the funds and in November 2018 we celebrated together the dedication of the new building that will house the Child Development Center on weekdays and Children’s Ministry on Sundays.